1944 Jeune peinture Montréal, (Montreal Young painting) Université de Montreal, Montreal (circa 1944). 1945 Spring Show, Montreal Museum of Fine Arts, Montreal; also in 1946, 1947, 1949, 1952, 1954, 1965. The Montreal Contemporary Art Society, Montreal Museum of Fine Arts; also in 1946. Drawings by The Montreal Contemporary Art Society members, Montreal Museum of Fine Arts, Montreal and Eaton Fine Arts Gallery, Toronto. 1946 First exhibition by the Automatists group : Ouvrez les yeux (Open your eyes), 1257, rue Amherst, Montreal, April. 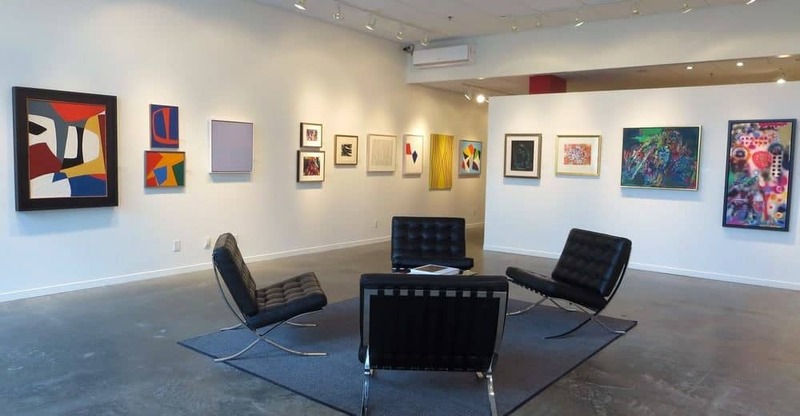 The Montreal Contemporary Art Society, Dominion Gallery, Montreal, Décember. Second Automatist exhibition at the Gauvrau’s residence, Automatists’group second exhibition, 75 Sherbrooke street West, Montreal, February-March. Marcel Barbeau avec son tableau “Fougue intermède gracile-toc“ (1946), à la seconde exposition automatistes, chez les Gauvreau, 15 février 1947. Photo Fonds Maurice Perron du Musée national des Beaux-arts du Québec, avec l’aimable autorisation de Line-Sylvie Perron. Copyright © Carmen Perron. Les Automatistes (The Automatists), Galerie du Luxembourg, Paris. International World Democratic Youth Festival, Prague. 1950 Les Rebelles (The rebels), Montreal. 1951 Les étapes du vivant (The steps to living), Montreal. 1952 Paintings by Paul-Émile Borduas and by a Group of Young Montreal Artists, Montreal Fine Arts Musuem, Montreal. 1953 Artistes de Montréal (Montreal Artist), Sainte-Adèle Art Centre, Sainte-Adèle, April-May. Salon des indépendants (The Independants’Art Show), Place des artistes, Montreal. 1954 La matière chante (The matter sings), Galerie Antoine, Montreal. 1955 Women Comittee Annual Art Sale, Art Gallery of Ontario, Toronto; also in 1962 and 1963. Exposition de Peinture Canadienne, (A Canadian Painting Exhibition), École des Hautes Études Commerciales, Montréal, November. 1956 Montreal Non–figurative Artists/Association des Artistes Non-figuratifs de Montréal, Restaurant Hélène de Champlain, February. Canada Art –Quebec Art, Montreal Museum of Fine Arts, August. 1958 Exposition d’art québécois (Quebec Art Show), Grands Magasins du Louvre, Paris, January. 1959 Automatiste Retrospective – Painting by Barbeau, Borduas, Ferron, Gauvreau, Leduc, Mousseau et Riopelle, Galerie de l’Étable, Musée des beaux-arts de Montréal, Montréal, September. 1962 La collection Charles Delloye (Charles Delloye’s collection), Galerie Denyse Delrue, Montréal , February. La peinture canadienne moderne: 25 années de peinture au Canada français (Modern Canadian painting: 25 years of painting in French Canada), Fith Two World Festival, Palazzo Collicola, Spoleto (Italy). Summer. Catalogue. Au centre, “Tomac” de Marcel Barbeau dans l’exposition “La peinture canadienne-française moderne”, Festival international des Deux Mondes, Spoleto, 1962. Photo Marcel Barbeau. © ADAGP pour Marcel Barbeau. Automatistes, Einaudi Gallery, Rome,. (A selection.of small paintings from the Spoleto exhibition). Back and White/Noir et blanc, Musée des beaux-arts de Montréal, Montréal, December. 1963 Five Quebec Artists, Pogliani Library and Gallery Gallery, Rome. Salon d’avril (April Show), Galerie Iris Clert, Paris. Fifth Canadian Painting Biennale, National Gallery, Ottawa (1963-64). 1964 Montreal Show: Barbeau, Beauchemin, Bellefleur, Comtois, Dumouchel, Lacroix, Lebkovitz, Letendre, Sullivan, Tousignant, Vaillancourt, Wales, Dorothy Cameron Gallery Ltd, Toronto. Toronto, June 11 to June 29. Biennale flottante (Floating Biennale), an off-Venice Biennale, organized by the Galerie Iris Clert on the ship Bella Laura, Salute, Venice. 1965 8th Exhibition and Sale of Contemporary Canadian Art, Montreal Fine Arts Museum, January 13 to January 21. Artists from Montreal, National Gallery of Canada, Ottawa, January. Young Canadian Painters, O’Keefe Centre for the Arts, Toronto, March. The Deceived Eye, Fort Worth Art Centre, Fort Worth, Texas, April. Catalogue. 1+1=3: Retinal and Perceptual Art, University of Texas, Austin, April. Catalogue. Micro Salon (Micro Art Fair), Galerie Iris Clert, Paris. Op from Montreal, Flemming Museum, Vermont University, Burlington, April 10 to May 5. Artists from Montreal, a travelling exhibition organized by National Gallery of Canada, Ottawa, 1965. Catalogue. Sixth Canadian Painting Biennale, National Gallery of Canada, Ottawa, June 1965. Two aspects of Canadian artists : their works and their portaits by Gaby, Montreal Fine Arts Musuem, Montreal, July 15 to August 15. Les artistes du Québec (Quebec Artists), Université Laval, Québec, August. August Art Festival, East Hampton Gallery, New York, August 23 to September 10. Fifth annual exhibition International Artists’ Seminar, Empire State Building Gallery, New York, September. Catalogue. Concours artistique du Québec (Quebec Annual Art Competition Show), MACM, October. Selection of Optical Art from the International Artists’ Seminar at Fairleigh-Dickinson University, Art Gallery, Douglas College at Rutgers, The State University Rutgers, New Brunswick, New Jersey, November. Op Art, Foley’s Gallery, Houston, Texas. Penthouse Show, Museum of Modern Art, New York. Op Art, a travelling exhibition organized by University of Ohio. Catalogue. Purity and Vision, Southampton College, New York. Op Art Seminar Show, Fairleigh-Dickinson University, Madison, New Jersey and Riverside Museum, New York, 1966. Op Art, The Hart House, University of Toronto, Toronto . 1966 Sixième biennale canadienne de peinture, MBAC, Montréal. Artistes de la galerie (Artists from the Gallery), Galerie du Siècle, Montréal, January. Color Motion, Fine Art Foundation of Connecticut, Hartford, Connecticut, February. The Selective Eye, Art Gallery of Ontario, Toronto, February-March. Selection from the Permanent Collection, Rose Art Museum, Brandeis University, Waltham, Massachusetts, May. Catalogue. Emphasis Optic, University of Massachusetts, Amherst, Massachusetts, May. Catalogue. Whence Op, Heckscher Museum, Huntington, New York State, May. An Exhibition of Retinal and Perceptual Art, University Art Museum, University of Texas, Austin, 1966. Catalogue. Optical’ 66, Argus Gallery,Madison, New Jersey, 1966.
International Exhibition, Hilton international Hotel, New York, 1966. Montreal Collect: Last Decade, Montreal Museum of Fine Arts, Montreal, December. Catalogue. Visual ’66– The Critics’Choice, Fairview Centre, Pointe-Claire, Quebec, 1966. Op Art and its antecedent, (a travelling exhibition organized by the American Foundation of Arts, November 1966 to October 1967. Centennial Exhibition: Québec and Ontario Painters, a travelling exhibition organised by the Centennial Commission Visual Arts Grants Program and Ontario Art Council. Vingt ans d’art affranchi (Twenty years of open minded art), Quebec National Museum of Fine Arts, Quebec, February. Acquisitions: 1966, Musée d’art contemporain de Montreal, February. Optical Illusion and Color Motion, Albrigh College Library and Art Gallery, Reading, Pennsylvanie,March 15 to May 11. Panorama de la peinture du Québec de 1940 à 1966 (An overview of Quebec painting), Montreal Contemporary Art Museum, Montreal, May-September. Catalogue. Canadian Art, Canadian Pavillon, Expo 67 – Terre des Hommes International Exhibition, Montreal, May-September. Three hundred years of Canadian Art, National Gallery of Canada), Ottawa, May. Marcel Barbeau, Ron Martin, Jean Noël, Carmen Lammana Gallery, Toronto, July-August 1967. Centenial Art Exhibition Quebec-Ontario, a travelling exhibition organised by the Art Gallery of Ontario, Fall 1967 -1969. Concours artistiques du Québec 1967 (Quebec Annual Art Competition Show), Montreal Contemporary Art Museum, Montreal, November. Espace dynamique 1956-1967 (Dynamic Space1956-1967), Galerie du Siècle, Montréal, novembre 1967. 1968 Seven Montreal Artists, Hayden Gallery, Massachusetts Institute of Technology, Cambridge, Massachusetts, January Catalogue. Canada Council Collection, a travelling exhibition organized by the National Gallery of Canada, January. Acquisitions récentes (New purchases exhibition), Montreal Contemporary Art Museum, Montreal, June. Young French Canadian Artists, Southeasterm Massachusetts Technological Institute, Dartmouth, Mass., July. Canada 101, Edinburg International Festival, Edimburg (Great-Britain). Catalogue. Exposition d’ouverture (Opening exhibition), Nouvelle galerie Denyse Delrue, Montreal, September. Christmas Show: Small works, Carmen Lammana Gallery, Toronto, December. 1969 Concours artistiques du Québec 1969 (Quebec Annual Art Competition Show), Musée du Québec et Musée d’art contemporain de Montréal, Quebec-Montreal, February-March. Form and Color, a travelling exhibition organized by the National Gallery of Canada, April. Catalogue. Two Hundred Years of Quebec Painting, Douglas Hall, McGill University, Montreal, July. Summer Exhibition, Scarborough College, Toronto, July. 1970 Peintures grands formats (Large paintings), Montreal Contemporary Art Museum, Montreal, January. Peinture Québécoise (Quebec Painting) Quebec Pavillon, Terre des Hommes, Montreal, Summer. Cross Section ’70, Carmen Lamanna Canada, Toronto, August. Rétrospective de la peinture au Québec de 1940 à nos jours (A retrospective of Quebec painting 1940-1970), Collège Saint-Louis, Edmunston, New-Brunswick, September. 1971 Borduas et les Automatistes : Montreal – 1942 –1955 (Borduas and the Automatists), Galerie nationale du Grand Palais, Paris, October and Montreal Contemporary Art Museum, Montreal, November- Décember. Catalogue. 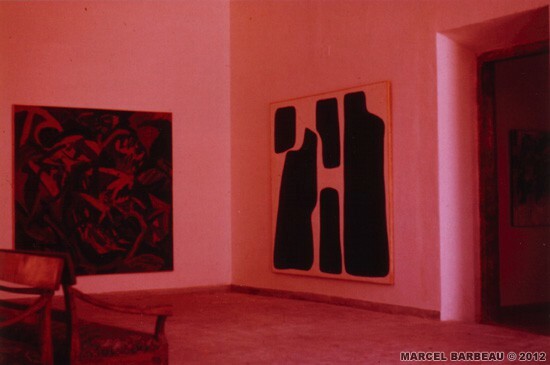 1972 Quatrième festival de peinture (Fourth Painting Festival), Château-Musée, Cagnes-sur-Mer, (France), July. Catalogue.Création Québec, a travelling exphibition organised by Quebec Ministry of Cultural, 1972. Catalogue. Les arts du Québec (Arts from Quebec), Quebec Pavillon, Terre des Hommes, Montreal, 1972. Collection Gisèle et Gérard Lortie (The Gisèle and Gérard Lortie’s Collection), Montreal Contemporary Art Museum, Montréal, December. 1973 Recent Acquisitions, Winnipeg Art Gallery, Winnipeg, January.Contemporary canadian painting and Sculpture, Winnipeg Art Gallery, May. Works in the Winnipeg Art Gallery Collection, Winnipeg Art Gallery, September 1973-December 1974. 1974 Salon de Mai (May art show), National Museum of Modern Art, Paris, May.Les arts du Québec (Arts from Quebec), Quebec Pavillon, Terre des Hommes, Montreal, Summer. Petits formats de la collection (Small paintings from the permanent collection), Montreal Contemporary Art Museum, Montréal (MACM), Montréal, July 1974. “Pipes’ Dreams 3” au Salon de Mai, Musée National d’Art Moderne, Paris, 1974. Confederation Center Art Gallery and Museum, Charlottetown. The Green Heritage, National Museum of Natural Sciences, Ottawa, Canada,September-October. 1975 Summer Exhibition, Confederation Centre Art Gallery and Museum, Charlottetown, I.P.E.,July. The Collective Unconscious, The Edmonton Art Gallery, Edmonton, Dsecember 5 – January 18 1976. 1976 Cent onze dessins du Québec (111 Drawings by Quebec artists), Montreal Museum of Contemporary Art, Montreal, January. Catalogue. Spectrum, a travelling exhibition organized by Canadian Royal Academy Montreal Olympic Games, Summer. Catalogue. Trois générations d’art québécois: 1940-1950-1960 (3 generation of Quebec artists), Montreal Contemporary Art Museum, Montreal, July-August. 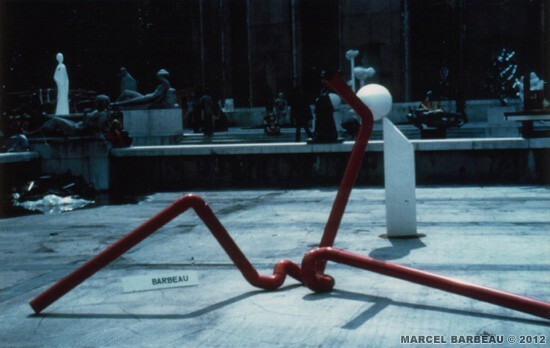 Sculptures monumentales (Outdoor sculptures), Musée d’art contemporain de Montréal, Montréal, Fall 1976. De la figuration à la non-figuration (From figurative to non-figurative art), a travelling exhibition organized by Montreal Contemporary Art Museum, September 1976-1977. 1978 Trentenaire de “Refus global”, Total refusal’s 30th Anniversary, Montreal Contemporary Art Museum, Montreal, December 1978 and Quebec National Museum of Fine Arts, Quebec, January- February. Catalogue.Modern Painting in Canada, The Edmonton Art Gallery, July-August. Catalogue. Directions in Contemporary Art, Winnipeg Art Gallery, Winnipeg, September. Rental Exhibition, Sarnia Public Library, Sarnia, Ont., September. Œuvres québécoises de la collection du Musée d’art contemporain de Montréal : 1940-1960 (Quebec works from the MontreaL Museum of Contemporary Art), Galerie HEC, École des HEC, Université de Montréal, Montréal, September. Tendances actuelles (Actual trends), Montreal Museum of Contemporary Art Montreal, November 9- December 10. Catalogue. 1979 La révolution automatiste (The Automatist revolution), a travelling exhbition organised by the Musée d’art contemporain de Montréal, Montreal, 1979-1981. (Catalogue)Frontiers of Our Dreams: Quebec Painting in the 1940’s and 1950’s, Winnipeg Art Gallery, Winnipeg, Febuary-April. Catalogue. 1980 Hot and cold, National Gallery of Canada, Ottawa, JanuaryThe Contemporary Arts Society: Montreal 1939-1948, a travelling exhibition organized by The Edmonton Art Gallery, September. Catalogue. Dix ans de propositions géométriques le Québec 1955 –1965 (Ten years of geometrical approaches), Musée d’art contemporain de Montréal, Montreal, (a travelling exhibition of works from the museum’s permanent collection), september 1979- October 1981. Il y a vingt ans: situation de la peinture et de la critique en 1962 (Twenty yars ago: painting and crtitic in 1962), Saint-Laurent Museum, Saint-Laurent, Quebec. Art Expo International, Coliseum, New York, april. 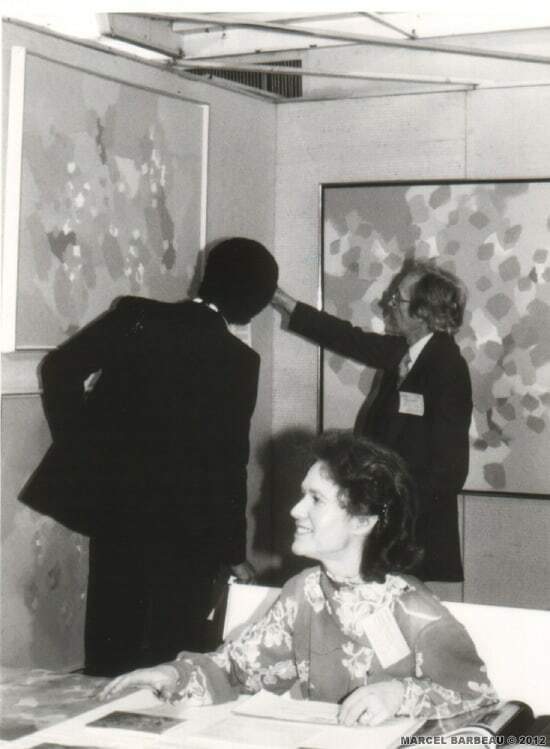 Marcel Barbeau et un amateur d’art à Art Expo, New York, 1982. Photographe inconnu. The Essential Line, Confederation Centre Art Gallery and Museum, Charlottetown, Ile-du-Prince-Edouard. 1983 L’Association des artistes non figuratifs de Montréal, exposition itinérante organisée par la Galerie d’art de l’Université Concordia, Montréal (catalogue)500 oeuvres choisies: cinquantième anniversaire (A selection of 500 works from the permanent collection : Fiftieth anniversary exhibition), Quebec National Museum of Fine Arts, Quebec,1983. Catalogue. 1984 Nouvelles acquisitions, (New acquistions), Montreal Musuem of Fine Arts, Montréal, juillet–août 1983. Montreal Non-figurative Painters Association: 1952-1961, a travelling exhibition organized by Concordia Gallery, Concordia University, Montreal, September-October. Catalogue. Œuvres sur papier (Works on paper), Galerie Samuel Lallouz, Montréal, October. 1985 Nouvelles acquisitions de la collection de prêts (New acquistions for the lending collection), Musée du Québec, QuébecA Celebration of Sculpture for Architecture, Galerie Esperanza, Montréal. Les vingt ans du musée à travers ses collections (The museums’twenty years history through the collection), Montreal Contemporary Art Museum, March-April. Catalogue. Dessins et estampes canadiens, (Drawings and Prints from the permanent collection), Cabinet des estampes, Musée des beaux-arts de Montréal, November 1985 –January 1986. 1986 Point, ligne, plan (Point, line and field), Musée d’art contemporain de Montréal, Montreal, March.The Automatists: Then and Now, Dresdnere Gallery, Toronto, May. Catalogue. La banque d’œuvres d’arts/Works from the Art Bank, Centre de recherche industrielle du Québec, Montréal, June. Lachine Carrefour de l’art et de l’industrie (Lachine at the junction of Art and Industry), Caravane muséologique, Musée de Lachine, Lachine (Montréal), June–August 1986. Les années Soixante ( The Sixties), Galerie Lacerte, Québec, October-November. Les années cinquante / The Fifties, Don Stewart Gallery, Montréal, Decembre. 1987 Sculptures canadiennes contemporaines, (Canadian Contemporary sculpture), Galerie Daniel, Montréal, February.La peinture québécoise en mutation (Ever changing Quebec painting), National Poetry Festival, Cultural Centre, Trois-Rivières, Fall 1987. Catalogue. Vingt ans de peinture: choix d’artistes (20 years of painting; an artists, selection),Twentieth Quebec Artist Council Anniversary Exhibtion), Montreal Contemporary Arts Centre, Montreal, Fall, 1987, Catalogue. Painting in Quebec: 1946 à 1966, Galerie Don Stewart, Montréal. Une sculptures dans mon jardin (A sculpture in my garden), Montreal Botanical Garden, Montreal, December -January. 1989 Canadian Art Collection, Historical Selection: 1779-1962, Esso Ressources Gallery, Calgary, January. Art and sale benefit, exhibtion du musée, Musée Fortin, Montréal, February. Development of Canadian Art, The Glenbow Museum, Calgary, April, 1988. Nouvelles acquisitions (New acquisitions), Musée d’art de Joliette, Joliette June. Les Automatistes, Art and sale gallery, Montréal Museum of Fine Arts (MBAM), Montreal, April-May. Borduas et ses contemporains (Borduas and his contemporaries) galerie Waddington-Gorce, Montreal, June. Dessins Montréalais (Montreal drawings), Drawing and Print Gallery, Montreal Museum of Fine Arts, June-August. Refus global et ses environs (Total refusal and its surrounding), Quebec National Library, Montreal, 1988. Refus global : quarante ans déjà (Total refusal: 40 year after), La Petite Patrie Cultural Centre, Montreal. Catalogue. Monteal Drawings 1941-1958, salle 328, Montreal Fine Arts Museum, Montreal. July -August. Dimensions: peintures de la collection Teleglobe Canada (Sizes and dimensions: Paintings from the Teleglobe Canada Collection), Saint-Jean-sur-Richelieu Cultural Centre. Opening exhibition, National Gallery of Canada, Ottawa. May. Sculpture Seduction (Scupture Attraction: official opening exhibition of a new permanent monumental sculptures installation besides the Montreal metropolitain byke trails along the island’s shores), Montreal, June-October. Cérémonie d’ouverture de l’événement “Sculpture/Séduction”, organisé par le Conseil de la Sculpture du Québec, sous la présidence de Louise Page. Ville Saint-Laurent, juin 1990. De gauche à droite: Charles S.N. Parent, membre du conseil d’administration, Janou Gagnon, coordinatrice de l’événement, Jean-Pierre Goyer, président du Conseil des arts de la communauté urbaine de Montréal et les sculpteurs, Octavian Olarius, Marcel Barbeau, Tatiana Demidof-Séguin, Daniel Campeau, Charles Daudelin, André Fournelle, Gilles Larivière et Jean-Daniel Primeau. Photographe inconnu, avec l’aimable autorisation du Conseil de la sculpture du Québec. La collection Union-Vie (The Union Vie Collection), a travelling exhibition of this corporate collection organized by Drummond Cultural Centre, Drummondville. Catalogue. Art and Steel, a travelling exhibition organized by Via Rail, Montreal, Halifax, Toronto and Vancouver, september. The Automatiste Montreal painting of the 1940″s and 1950’s, The Drabinski Gallery, Toronto, October 1990. The Automatists – Canvas and paper, W. K. Kennedy Gallery, Northbay, Ont., October. Canadian Avant-garde The Sixties, Kaspar Gallery, Toronto, November. La Collection Maurice Forget 1955-1970 Années d’affirmation, Galerie Plein-Sud, Cégep Édouart-Montpetit, Longueil, Québec, December. 1991 Conseil de la peinture du Québec: vingt-cinquième anniversaire (Quebec Painting Council 25th anniverary), Notre-Dame de-Grâce Cultural Centre, Spring 1991. Black White, Winnipeg Art Gallery, Winnipeg, Man., June.Abstraction, Michel-Ange Gallery, Montreal, Fall, 1991. La collection permanente, (The permanent collection opening exhibtion) Montréal Fine Arts Museum, Montréal, November- December 1991. 1992 Canadian art tour- A Fresh Look at Canadian Art, Montreal Museum of Fine Arts,. La sculpture au Québec: naissance et persistance : 1946-1961 (Sculpture in Quebec; beginnings and persistence): 1946-1961) Quebec National Museum of Fine Arts, Quebec, April. Catalogue. Robert Ayre: the critic and the collection, Leonard and Bina Ellen Gallery, Concordia University, Montreal, April. La collection des Editions Gaétan Morin (Editions Gaétan Morin’s collection), Michel-Ange Gallery, Montreal, Spring. La collection: tableau inaugural I et II (An opening view on the permanent collection), Montreal Museum of Contemporary Art, May. Montreal: 1942-1992: l’anarchie resplendissante de la peinture (The radiant anrchy of painting), UQAM Gallery, University of Quebec in Montreal, May. Catalogue. Oeuvres de la collection permanente (Works from the permanent colection), Montreal Museum of Fine Arts, Summer 1991-1993. Une ville, un musée, une collection (A City, a musuem, a collection), Lachine Museum, September. The Crisis of Abstraction in Canada: the fifties, a travelling exhibition organized by National Gallery of Canada, Ottawa, November –April 1992 -94. Catalogue. 8th international print exhibition, Istituto per la Cultura e l’arte, College Capizzi, Catania-Bronte, (Italy), 1992. Présent Laurentides (Present laurentians), Vieux-Palais Exhibition Centre (Laurentians Contemporary Art Museum), Saint-Jérôme, 1992. Achieving the Modern: Canadian Abstract Painting and Design in the 1950’s, a travelling exhibition organized by Winnipeg Art Gallery, December1992 –June 1994. Catalogue. 1993 Nouvelles acquisitions (Recent acquisitions), Joliette Museum of Art. From Sea to Sea, The Edmonton Art Gallery, Edmonton, Al., April . 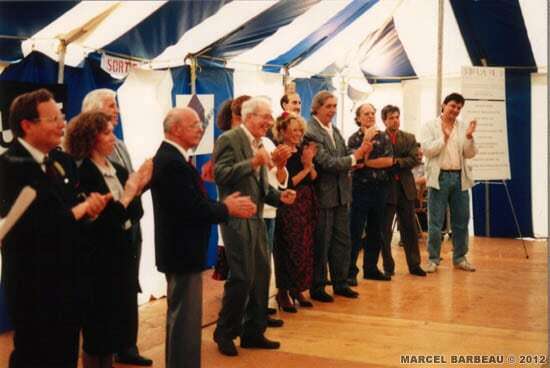 Quinzième anniversaire de la galerie (15th anniversary show), Drummond Exhibition Centre, Drummondville Cultural Centre, Summer 1993. The permanent collection, Montreal Museum of Fine Arts, Montreal,Summer. Abstraction: Which way from here?, Canada Trust Tower, Calgary, Al., September. 1994 Montreal painting 1930-1960: An Era of Change, W.K. P. Kennedy Gallery, North Bay, Ontario, March. Les Automatistes (The Automatists), Art Gallery of Ontario, April . Le partage d’une vision – La collection Lavalin, (Sharing a vision – The Lavalin Collection) Musée d’art contemporain de Montréal, Montréal, avril – octobre1994. Passions pour l’art du Québec (Passions for Art in Quebec City), Musée du Québec, Québec, June–October. New Acquisitions, Gallery Stratford, Stratford, Ont., July-August 1994. 1995 Contact: petits formats (Smaller works), Musée national des beaux-arts du Québec (Musée du Québec) Galerie 11, Pavillon Ballargée, Québec, April. Agnès Lefort Gallery: 1950-1960, Leonard & Biba Ellen Art Gallery, Concordia University, Montreal, April-June. 1997 Saint Hilaire et Les Automatistes (Saint-Hilaire and The Automatists), Mont-Saint Hilaire Museum of Art.Symposiums (sic) de Sculpture au Québec 1964-1997 (Sculpture Seminars in Quebec), Lachine Museum , Lachine, August-October. 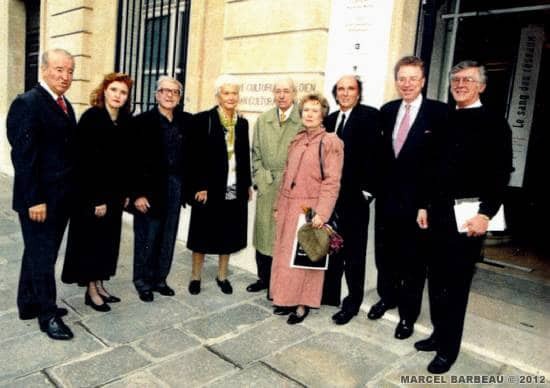 Itinéraire 97 (Itinerary ‘97), Levalois-Perret City Hall, France, September 1997; Guest of Honor. Grands formats (Large Works) Musée des beaux-arts de Sherbrooke, Sherbrooke, September . 1998 Acquisitions récentes (Recent acqusitions), Musée régional de la Côte Nord, Sept-ÎlesArt abstrait 1940-1997 ( abstract art 1940- 1997), Musée du Québec, Québec, February. Éternel présent: 50 ans après “Refus global” (Present for ever – 50 years after “Total refusal”), Mont-Saint Hilaire Museum of Art, May- September. Catalogue. Borduas et l’épopée automatiste (Borduas and the automatist epic), Montreal Museum of Contemporary Art, Montreal, June-September . Catalogue. The permanent Collection: 1915-1970, Montreal Museum of Fine Arts, Montreal, June-September. La donation Maurice Forget (The Maurice Forget Donation), Joliette Museum of Art, Joliette, June -September. The Objective mysteries – a selection of Quebec art works from the permanent collection -1948-1998, Leonard et Bina Ellen Art Gallery, Concordia University, Montreal, May-September. Dreaming in colors, Montreal Museum of Fine Arts, Montreal, June 1998- May 1999. Montreal: The Forties, National Gallery of Canada, Ottawa, Summer. Refus global (1948) (Total refusal- 1948), Musée canadien de la Poste, Musée des Civilisations, Hull (Gatineau), August. Canadian Artists and Human Rights The Thirties and the Forties, National Gallery, Ottawa, August-October. Paintings of “Total refusal”Fiftieth Anniverary Stamps Collection, a travelling exhibition organised by Canada Mail and Civilisations Museum, Gatineau (Hull), August1998; Canada High Commission, Londres, september 1998; Canada Embassy, Washington, December. Refus global (1948) Le manifeste du mouvement automatiste (The Automatis manifesto), Canadian Cultural Centre, Paris, October. Catalogue. Collection Desjardins d’oeuvres d’art, Musée Pierre Boucher, Trois-Rivières; également présentée au Musée-jardin du Domaine Cataraqui, Sillery, Québec. 2001 Les passeurs de l’an 2000- Témoins du XXème siècle (Ferrymen to Year 2000 –Withnesses of the Twentieth Century : Works on paper), Jean-Claude Bergeron Gallery , Ottawa, Canada, March 4-18. 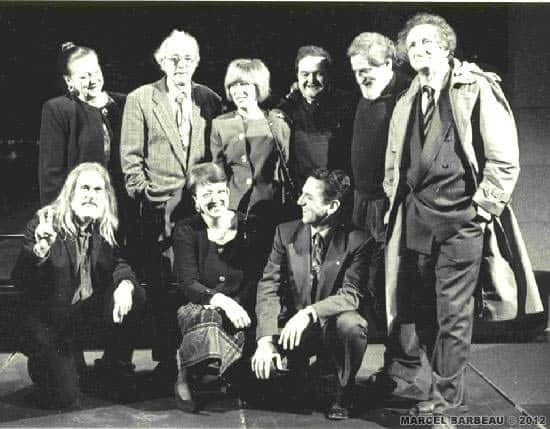 Les passeurs de l’an 2000- Témoins du XXème siècle (The Ferrymen to Year 2000 –Withnesses of the Twentieth Century), Chapelle du Bon Pasteur Cultural Centre, Montreal, March. Salon de Mai ( May Art Show), Espace Auteuil, Paris, May. Biennale Internationale Del Afrte Contemporaneo (International Biennakle of Contemporary Art) Fortezza da Basso, Florence, Italy, December 7 to 16. Catalogue. 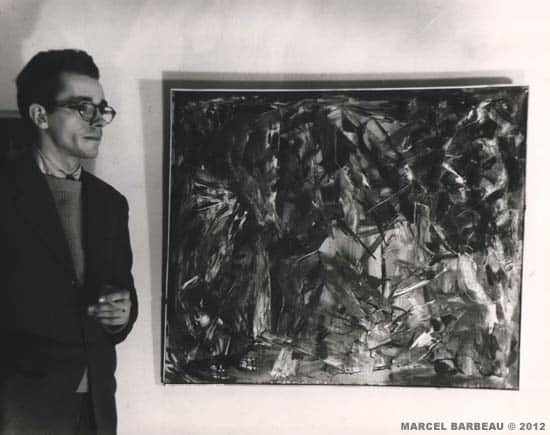 Marcel Barbeau was awarded a fifth prize in painting. 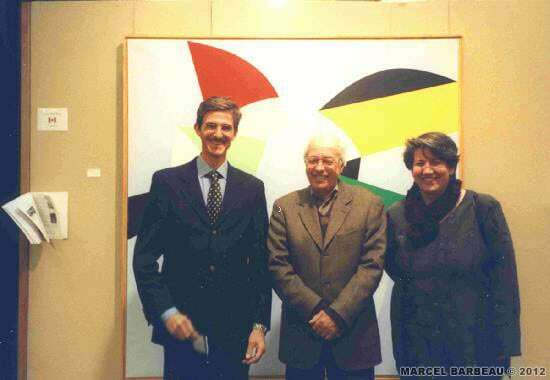 Marcel Barbeau devant son tableau “Amour, Champagne et autres choses” (2000) en compagnie Daniela Renosto, Directrice des Services culturels et touristiques du Gouvernement du Québec à Rome, et de son assistant à cette époque, Tomaso Thellung, à l’occasion de leur visite à la Biennale internationale d’art contemporain de Florence, décembre 2001. Photo Ninon Gauthier. © Ninon Gauthier et ADAGP – Paris pour Marcel Barbeau. 2002 Prints and Works on Paper Fair, 2, Place du Colonel Fabien, Paris, France, March 25 to April 14. Abstraction et figuration : 20 artistes Œuvres choisies (Abstract and figurative Art : 20 Artists –Selected Works), Galerie Bernard, Outremont, Montréal, June 11 – July 13, 2002. 1972 ou l’origine réinventée d’une collection inaugurale, Les 30 ans de la collection du Musée régional de Rimouski (1972 a fictive origin of the permanent collection), Musée régional de Rimouski, Québec, June 16 to September 2, 2002. Feria picturale : Artist of Honor (Painting feria), Saint-Agather, Quebec, August-September. Triennale internationale d’art contemporain (International Triennale of Contemporary Art), Grande Arche de La Défense, Paris, France, September 17 – October 12, 2002. Infiniment bleu (Infinitely blue), Musée de la Civilisation, Québec City. Montreal Jazz Festival posters: Guest of honor, Place des arts, Montreal, June-July. Éclatement de formes et de textures, l’art des années 1960 à travers la collection du Musée du Bas-Saint-Laurent (An outburst of forms and textures: the art of the sixties through the museum collection), Musée d’art de Mont-Saint-Hilaire, Mont-Saint-Hilaire. Éloge du petit format dans l’art d’aujourd’hui (Homage to the small size in contemporary art) an exhibition under Who’s Who in International Art publishers partonage), Centre Christine Peugeot, Paris, France, October. 2004 Regards sur l’art québeçois : la collection d’oeuvres d’art de l’Université de Montréal (Insight on Quebec art: the University of Montreal Collection), University of Montreal Art Gallery. January-March. 2005 Les années Soixante au Canada- The Sixties, National Gallery of Canada, Ottawa, February-April 2005. Des œuvres en série : Acquisitions récentes (Works in Series: New Acquisitions), Musée national des beaux-arts du Québec (Quebec National Museum of Fine Arts), Québec, Québec, June –October 23. Penser en grand (Thinking Big), Musée d’art de Joliette, Joliette, October 23 –January 20 2005. Dessins et œuvres sur papier de la collectiion permanente (Drawings and works on paper from the permanent collection), MACM (Montreal Museum of Contemporary Art), October 26 2005- January * 2006. 2006 7e Festival Montreal en lumière (7th Montreal Light Festival), enlighting of major sculptures in the Lachine outdoor Sculptures Museum. Art and Society in Canada : 1913-1950, a travelling exhibition organized by the National Gallery of Canada, starting at the Glenbow Museum, Calgary March 17- June 4 2006, To be also shown at : Yukon Art Centre (March 22-May 13 2007 ; Mc Michael Canadian Art Collection, June 29- September 23 2007 ; Kamloops Art gallery January- March 2008. Explosion of Forms and Textures: Quebec Art of the 1960s from the Bas-Saint-Laurent Museum, Triangle Gallery of Visual Arts, Calgary, June 15 – August 26, 2006. Quebec Connection – Summer Art Stroll (a series of the satellite art exhibitions at 10 Calgary-based public and commercial art galleries and artists’ studios, and celebrating contemporary art and design from Quebec), Triangle Gallery of Visual Arts, Calgary June 15 – August 26, 2006. 2007 Barbeau, Goodwin, Hurtubise et Serra, Galerie Bellemare, Montreal, 3 au 24 février 2007. Démystifier l’art,/Demystifyaing Art : L’abstraction au Québec hier et aujourd’hui, Galerie d’art Stewart Hall, Pointe-Claire, Québec, 5 mai – 5 juin 2007. Rétrospective des 25 ans du Symposium international d’art contemporain de Baie Saint-Paul, Centre d’expositon de Baie Saint-Paul, Baie Saint-Paul, Québec, Canada, 2 juin-6 janvier 2007. L’Abstrait d’hier à aujourd’hui, Galerie Michel-Ange, Montreal, October 14-26-January 7, 2008. 2008 This is Montreal, Galerie Leonard& Bina Ellen, Université Concordia, Montreal, March 13- April 19.Déserts, rivages et autres solitudes, Galerie Roger Bellemare, Montreal, March 29 – April 19 . Contemporary Exhibition, Vincent Gallery, Ottawa, June 8-21. Refus global : Soixante ans plus tard, Musée des beaux-arts du Canada, Montreal, June 19 -December 7. Automatistes 1945-1965, Galerie Orange, Montréal, September 4- 28 2008. 2011 Lieux, Work from the Collection, Curator : Bernard Lamarche, Salle Alphonse-Desjardins, Musée régional de Rimouski, Rimouski, Jun 19 – September 11. 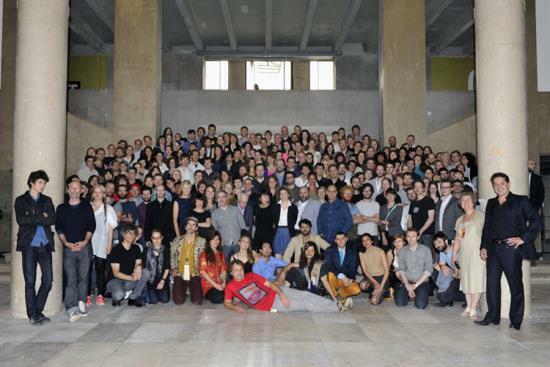 Photo officielle du vernissge de l’événement “Nouvelles vagues” et lancement du catalogue du musée, Palais de Tokyo, Paris, 20 juin 2013. À Lavant à droite Ninon Gauthier, épouse de Marcel Barbeau, et Jean de Losey, directeur du Palais de Tokyo. Au centre vers la gauche Marcel Barbeau et sa galeriste Marion Chauvy. 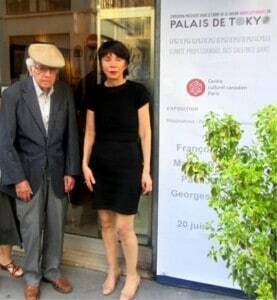 Marcel Barbeau et Marion Chauvy directrice et propriétaire de la galerie au vernissage de l’exposition. 20-06-2013. Vie de plateau, Pointe-à-Callière Museum, Montreal octobre 23 2013 – September 1st 2014. View of the exhibition Les automatistes en 3 temps, Galerie Michel Guimont. Pol Bury, Lucio Fontana, Ad Reinhardt and Jean Tinguely was also part of this exhibition.